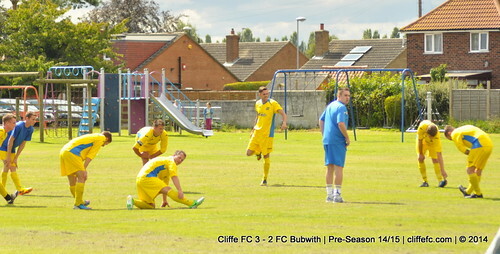 After a string of friendly cancellations, Cliffe FC’s first team finally get a run-out and do so with a 3-2 win against FC Bubwith. Cliffe took the lead in the first few minutes, Kev Taylor breaking the offside trap, bursting down the right and slide the ball across the goal for a simple finish for youngster Bayley Smirthwaite, 1-0. Cliffe dominated the next few minutes but slacked off and allowed Bubwith back into the game, Bubwith deservedly equalised with Jamie Sedman with the goal, 1-1. A bizarre goal saw Cliffe retake the lead, a Bubwith defenders attempted clearance cannoning off Smirthwaite and into an empty goal, 2-1. Bubwith’s Sedman equalised before the break with a great hit, 2-2 at the break. 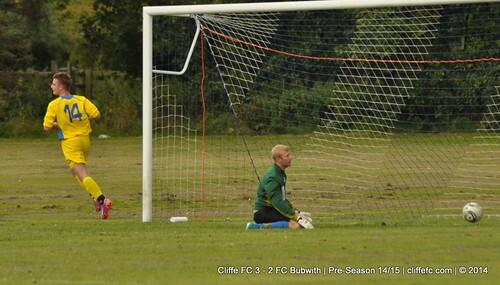 The only goal of the second half came from Cliffe, the winner from Alan Jackson who broke past the last defender to slot the ball calmly into the net, 3-2. Ryan Mitchell impressed once more in the heart of the back four, as did Darren Jackson when he was introduced at the break a groin injury forcing him off early. 3-2 was the final score, Cliffe looking good in places but lots of room for improvement going into next Saturday’s friendly before the season starts on 6th September. The New Inn Cliffe FC MOTM: Ryan Mitchell. Harris, R Sedman, Edwards, A Jackson, Mitchell, Pearse, White, Taylor, Robinson, Hogg, Smirthwaite, D Jackson, A Trailist, Laverack. Cliffe FC Goals: Smirthwaite (2), A Jackson. Sunday Team Summary – 24th August 2014. 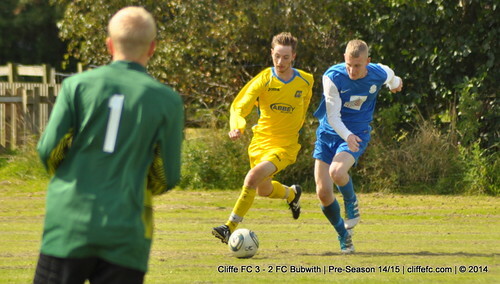 Sunday saw Cliffe FC Sundays host Bubwith’s top flight Sunday team, Bubwith White Swan. The higher division side walked away with a 4-2 win, Cliffe’s goals came from Nigel Horner in the first half and a special Nathan Parker free-kick in the second half. Another encouraging Sunday team performance as their YSML Division Three season approaches, next Sunday they host Hambleton FC.